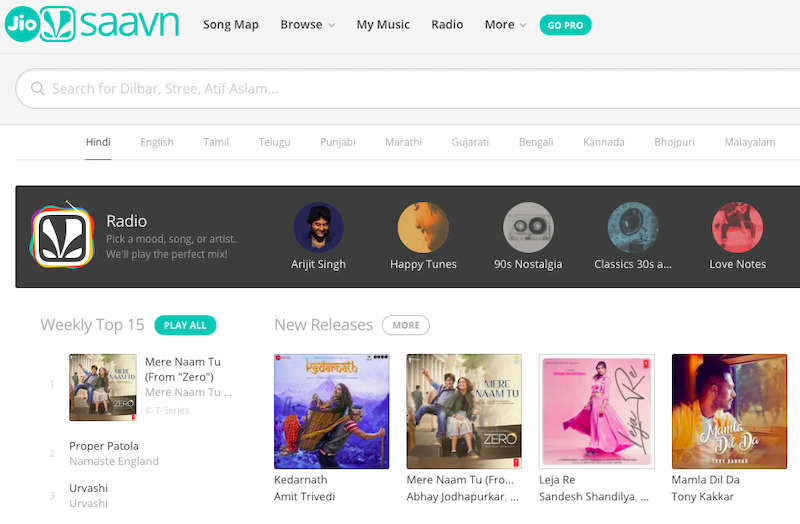 Saavn Media, a unit of Reliance Industries, Tuesday unveiled South Asia’s largest streaming, entertainment and artist platform, JioSaavn, marking the official integration of JioMusic and over-the-top platform Saavn. “The new integrated JioSaavn app will be available across all app stores including the Jio app store, on JioPhone, as well as, at www.jio.com/jiosaavn,” the company said in a statement. The new JioSaavn app, will bring a suite of in-app products and music experiences, including an interactive lyrics feature, localised vernacular display, custom integrations with concerts and live events, and exclusive video content over the next few months. “As announced in March 2018 at the time of acquisition of Saavn by Reliance Industries, the implied valuation of the combined entity at over USD 1 billion makes it the most valuable music streaming platform in South Asia…,” the statement added. With a catalogue of over 45 million songs and original content, JioSaavn aims to combine the streaming media expertise of Saavn with Jio’s digital services ecosystem. The integrated app is eyeing a “massive addressable market opportunity” both in India as well as the Indian diaspora, it added. The service will be offered on a ‘freemium’ model in India with all users having access to the ad-supported product. Jio subscribers – over 252 million at the last count – would have access to the integrated app. As part of the launch, Jio users will also get a 90-day extended free trial of JioSaavn Pro, the streaming service’s premium product, the statement added, according to PTI. Akash Ambani, Director of Reliance Jio, said that JioSaavn represented a turning point for the music streaming industry in India, as the country continues to experience fast-paced tech innovation, rapid adoption of digital services, and a digital music industry, at par with global leaders. The Saavn co-founders Rishi Malhotra, Paramdeep Singh and Vinodh Bhat continue in their leadership roles to fuel the growth of the company. JioSaavn’s team of over 200 employees also continue to operate from five global offices at Mountain View and New York in the United States, and Bengaluru, Gurugram and Mumbai in India.